You cannot read the Gospels without encountering our parish patron, Saint John the Baptist. John the Baptist is the last of the prophets of the Old Covenant, and the forerunner of the Messiah, announcing the beginning of the New Covenant. John the Baptist is the only other person besides the Lord Jesus whose birth and death is recorded in the Gospels. In the Church calendar year the births of only three persons are commemorated: Our Lord on December 25th, His blessed Mother on September 8th and St. John the Baptist on June 24th. The Church commemorates the martyrdom St. John the Baptist on August 29th. From the Gospels we learn many details about the life and times of our patron saint. Zechariah could hardly believe what he was hearing and asked the angel how he was to know that all this was true as both he and his wife were advanced in years. The angel told Zechariah his name—Gabriel, who stands in the presence of God. Gabriel told Zechariah that God sent him to bring this good news to Zechariah. He gave Zechariah a sign: “And behold, you will be silent and unable to speak until all these things come to pass.” While all this was happening to Zechariah, the people outside were wondering why the burning of the incense was taking so long. Finally, Zechariah came out to the courtyard where the people were, he was unable to speak. The people could see that something had happened to Zechariah during the burning of the incense. He made signs to them, but remained mute. When his time for service to the temple ended he went home. Not long after his wife Elizabeth became pregnant, she was overjoyed that her prayer for a child was to be answered. While Zechariah and Elizabeth awaited the birth of their son John, the angel Gabriel announced another birth. Gabriel was sent one more time from the throne of God to a city in Galilee called Nazareth to the Virgin Mary. Our story here concerns John the Baptist, but you should read this part of the story in the Gospel of Luke, Chapter 1, verses 26-38. Besides learning that she was to be the mother of the Messiah, Mary learned of the pregnancy of her kinswoman Elizabeth from Gabriel. After the angel left, Mary traveled from Nazareth to the hill country of Judah to visit Elizabeth and help her. The next part of the story continues in Luke Chapter 1, verses 39-56. Mary stayed with Elizabeth for about three months and then returned to her home in Nazareth. Luke ends his narrative about the birth of John the Baptist here. We resume John’s story in Chapter 3 of Luke. The other evangelists, Matthew, Mark and John do not mention the details surrounding the birth of John the Baptist, but begin with his preaching. Luke continues his narrative of the life of John the Baptist by setting John’s prophetic ministry in historical context by telling us the names of major political and religious figures of John’s day…names from history—Tiberius Caesar, Pontius Pilate, Herod (Antipas—son of Herod the Great), Herod Philip (another son of Herod the Great), Annas and Caiaphas (high priests of that time). Matthew just tells us, “In those days…” Mark sets the stage by quoting the prophet Isaiah. John the Evangelist introduces John the Baptist in the beautiful prologue of his gospel—“There was a man sent from God whose name was John.” (John 1:6-8) and that John came to bear witness to the light. To understand the role of John the Baptist in the plan of salvation, turn to the book of the Prophet Isaiah. Beginning in Chapter 40 of Isaiah, God speaks words of comfort to his people who are in exile in Babylon. “A voice cries: In the wilderness prepare the way of the Lord, make straight in the desert a highway for our God.” To get an idea of the preaching of John the Baptist, read Matthew 3: 1-12, Mark 1: 1-8, Luke 3: 1-20, and John 1:19-28. John must have been a striking figure to behold. He looked like a prophet. The gospels describe what John wore and what he ate—“Now John wore a garment of camel’s hair, and a leather belt around his waist; and his food was locusts and wild honey.” John preached repentance to the people. He administered a baptism to the people who responded to his call for repentance. If you wanted to hear John preach, you had to make an effort. John did not preach in the synagogues, or in the Temple precincts, or on street corners of the big cities, but “in the wilderness” in the region about the Jordan River. Word about John spread and the people came out to hear John preach. Some wondered if John was the promised Christ. John knew who he was and what his mission was: “I baptize you with water for repentance, but he who is coming after me is mightier than I, whose sandal I am not worthy to carry; he will baptize you with the Holy Spirit and with fire.” The people asked John, “What then shall we do?” John advice: “He, who has two coats, let him share with him who has none, and he who has food, let him do likewise.” He had advice to tax collectors and soldiers…anyone responding to his message. John’s message was accepted by many people, but others resented him. Among those who resented John’s message was Herod Antipas, the son of Herod the Great and the Tetrarch (ruler) of Galilee and Perea and his second wife, Herodias. He divorced his first wife; Herodias had been the wife of his brother. Herodias had a daughter from her first marriage, Salome. John condemned Herod’s marriage to Herodias as unlawful. Besides his role as the forerunner of the Messiah, John the Baptist was a witness (martyr) to the indissolubility of marriage. John declares: “Behold the Lamb of God” to his hearers. Two disciples hear this and followed Jesus. One was Andrew who after talking with Jesus finds his brother Simon (Peter) and tells him, “We have found the Messiah.” John directs his followers to the Lord Jesus. The Gospels of Matthew and Mark, (Matthew 14: 3-12, 6-8; Mark 6: 17-29) recount various details about the arrest and imprisonment of John. Herod has John arrested and imprisoned. The daughter of Herodias dances for Herod at a banquet given for his birthday. Herod is so delighted with her dancing that he promises to give her anything she asks, “up to half my kingdom.” The daughter asks her mother, “What shall I ask?” Her mother says, “The head of John the Baptist.” So as not to embarrass himself in front of his guests, Herod has John beheaded; his head is placed on a platter and given to the girl who in turn gave it to her mother. While the gospels never name the daughter of Herodias, the historian Josephus provides her name—Salome. 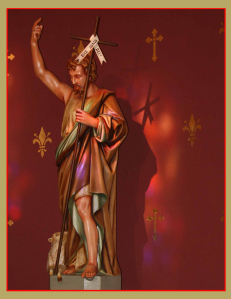 Download a page of prayer cards for our Patron Saint, St. John the Baptist here. Did you miss the celebration of our Patron Saint’s birthday… view the presentation here.